Chalfonte is an oceanfront condominium community located at 500 and 550 South Ocean Boulevard in East Boca Raton, FL. This beachfront condominium community consists of twin 23-story towers with a total of 378 private luxury condos that offer incredible views of the Atlantic Ocean to the east and Lake Boca Raton to the west. Originally constructed in 1974, Chalfonte has recently undergone multi-million dollar renovations to the North and South Towers, which included remodeling of the lobby areas, hallways, swimming pools, and gardens. Many of the condominiums in Chalfonte have also been completely remodeled, offering two bedrooms and two bathrooms with 1,400 to 1,900 square feet of living space. These spacious oceanfront condos feature split bedroom floor plans, walk-in closets, tile floors, and updated kitchens with granite countertops, custom cabinetry, and stainless steel appliances. Other features include oversized bedrooms, luxurious bathrooms with his and her sinks, open layouts perfect for entertaining, and large private balconies with tiled floors, Jacuzzis, and plenty of sitting room for relaxing and enjoying the spectacular views. Residents of Chalfonte enjoy use of the community's numerous on-site amenities including tranquil Japanese-inspired gardens, private beach access, cabana access on the Intracoastal, two heated oceanfront pools, two tennis courts, and a state-of-the-art fitness center. Chalfonte also offers a community marina with a common boat dockage, as well as 16 private docks, providing residents with easy access to a host of water-based recreational activities. Residents also enjoy a gorgeous new lobby, clubhouse, billiards, business center, social rooms, community library, extra storage, covered garage parking, walking paths, 24-hour security, and furnished apartments available for when guests come to visit. Just South of Palmetto Park Road on A1A, Chalfonte's beachfront location is just a short drive from Mizner Park and Boca Town Center, both of which are popular destination offering some of the finest dining and shopping options in the area. Residents of Chalfonte also enjoy the convenience of being within walking distance to all of the action and excitement happening in downtown Boca Raton. Chalfonte is zoned for some of the top-rated schools in the area, including Boca Raton Elementary, and Boca Raton Community Middle and High Schools. If Chalfonte sounds like the perfect place to enjoy your South Florida lifestyle, other waterfront condominium communities in Boca Raton that you may be interested in as well are One Thousand Ocean, Beresford, and Mizner Court. 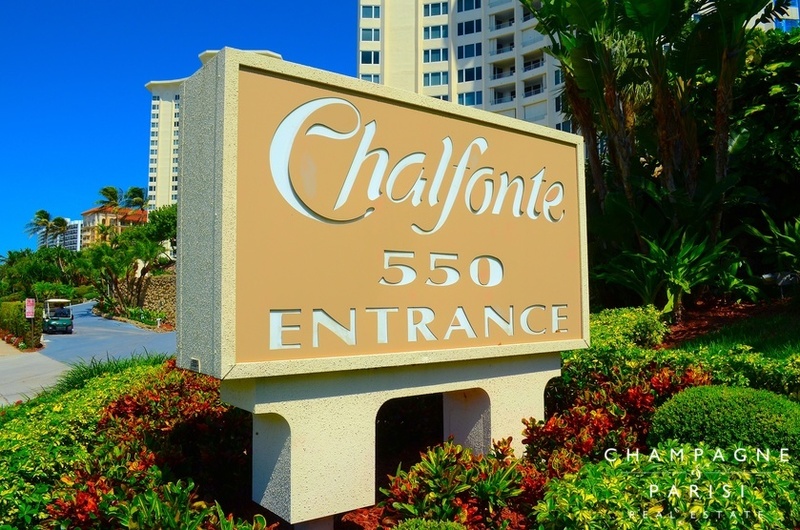 If you are interested in purchasing a Chalfonte condo for sale or would like to learn more about other Boca Raton condos for sale, please call us at 561-998-9015. You may also reach us by completing the simple online contact form provided below. We at Champagne & Parisi Real Estate look forward to assisting you in finding your next dream home in Boca Raton, FL!